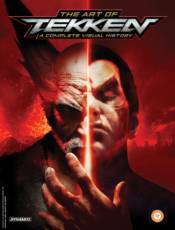 Twenty-five years ago, Namco released Tekken and redefined the fighting game genre in three dimensions. Known for its deep gameplay, cutting edge graphics, and operatic lore, Tekken has become synonymous with the PlayStation brand while remaining one of the last vestiges of the arcade. The Art of Tekken: A Complete Visual History follows the series history through a visual feast of iconic games and characters, as well as in-depth interviews with the Bandai Namco developers who made it a reality and the players who made it a phenomenon on its way to becoming one of the best-selling fighting game series in history. It's a complete visual retrospective of one of the most indispensable parts of gaming history, over a quarter century in the making, including art from all seven games of the franchise and more.